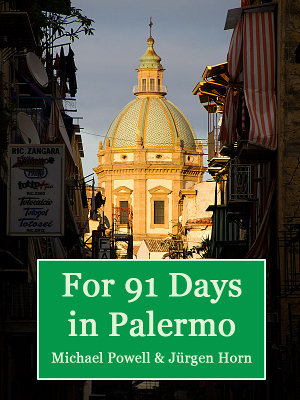 We’ve collected three months of our experiences in Sicily’s capital into an E-book, which you can download directly or buy on Amazon for your e-reader. 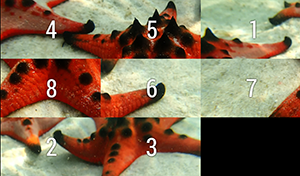 Get over two hundred full-color images, and all our articles from Palermo and Sicily in an easy-to-carry format. With a comprehensive index arranged by category and date, the e-book is easy to navigate, and filled with beautiful photos, amusing anecdotes, and detailed, well-researched descriptions of this Mediterranean city’s incredible food, culture and history. 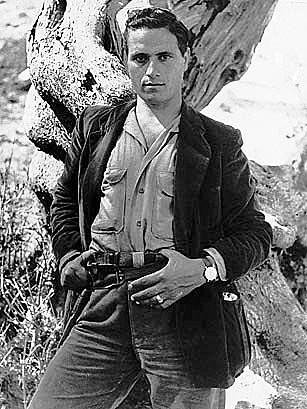 One of the most controversial figures in recent Italian history is Salvatore Giuliano, who enjoyed a reputation as the Sicilian Robin Hood, stealing from the rich to give to the poor. But that’s a simplistic and overly noble description of Giuliano, who operated out of Montelepre near Palermo and was a constant thorn in the side of the government and police. There are two types of eccentrics: those you feel sorry for, and those you’re secretly envious of. The first kind are poor and fill their house with cats. They have crazy, stringy hair and scream obscenities at malicious neighbor kids. The second kind have the good fortune of being royalty and are able to indulge their every screwy whim. “Bring in that funny peasant boy. Now do your silly dance! I need more cats, a leopard perhaps. 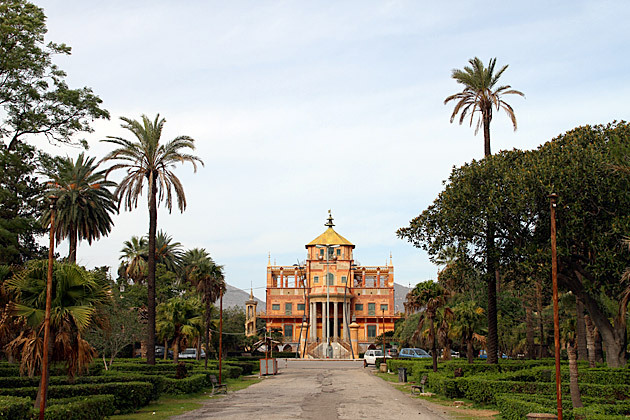 And build me a palace… a Chinese palace!” If you’re going to be an eccentric, it’s a lot better to be the rich kind. 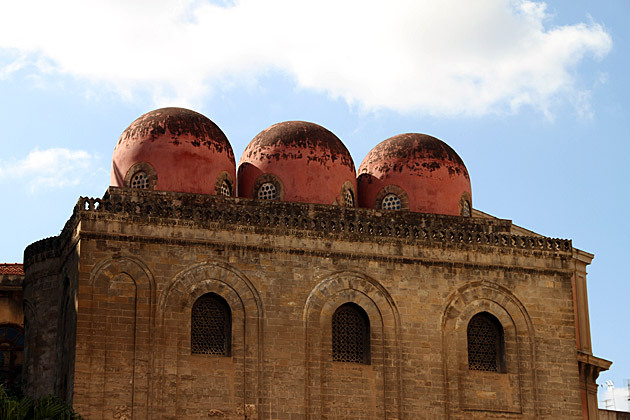 Three red domes immediately call attention to the tiny church of San Cataldo on Piazza Bellini, near the center of Palermo. A pristine example of Arab-Norman architecture, San Cataldo dates from 1160 and has survived into the present-day in a mostly original state. 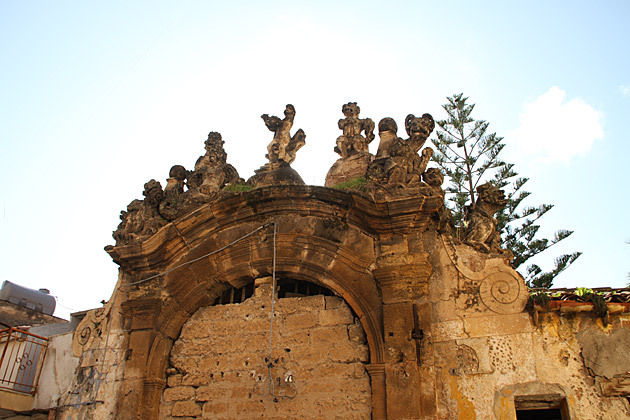 Without a doubt, the top touristic sight in the town of Bagheria is Villa Palagonia. A architectural masterpiece and ode to eccentricity, this building is most famous for its flock of “monsters”: an army of gargoyles who adorn the garden walls. 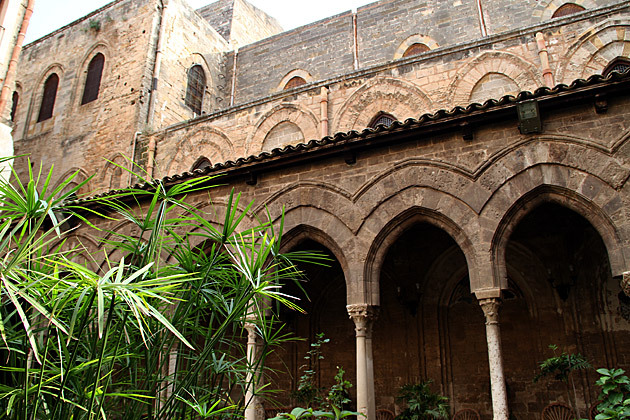 More than anything else, Palermo is awash in historic, beautiful churches. At least once a week, Jürgen and I will swear off visits to any further churches. “It’s enough”, we’ll cry! “We’re not even religious!” But then, we’ll read about another one, like the Magione. Founded in 1191. Used for three centuries as a lodge for the Teutonic Knights. Arab-Norman architecture. Five minutes from our house. With a lovely cloister. 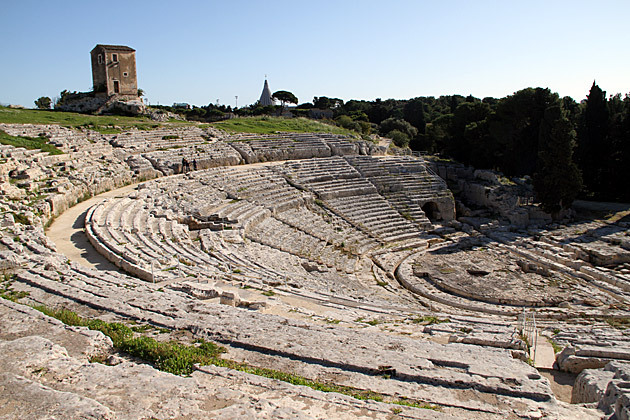 On our second day in Syracuse, we made our way to the Parco Archeologico della Neapolis, where some of Sicily’s greatest ruins are bunched together, almost as though our ancient forebears wanted to facilitate future tourist groups.